Chop the onion lengthwise. Add little salt and gently mix by your fingers so that the onion pieces will be separated. Leave it for ten to fifteen minutes. Chop the ginger and garlic finely. Crush the sombu to a coarse powder. Take out the onion and squeeze out the water completely and put it into a big bowl. Sprinkle corn or rice flour and mix gently. Then add red chilli powder, ginger, garlic, sombu powder, curry leaves and salt. Mix it. Then sprinkle besan flour little by little till all the onion pieces are coated well with the flour. No need to add water. The water content in the onion will suffice. Heat oil in a kadai. When it is hot, reduce the heat to minimum. Take out a lump of the onion pieces and gently press by your fingers and drop it loosely in the oil. Fry till it become golden brown. 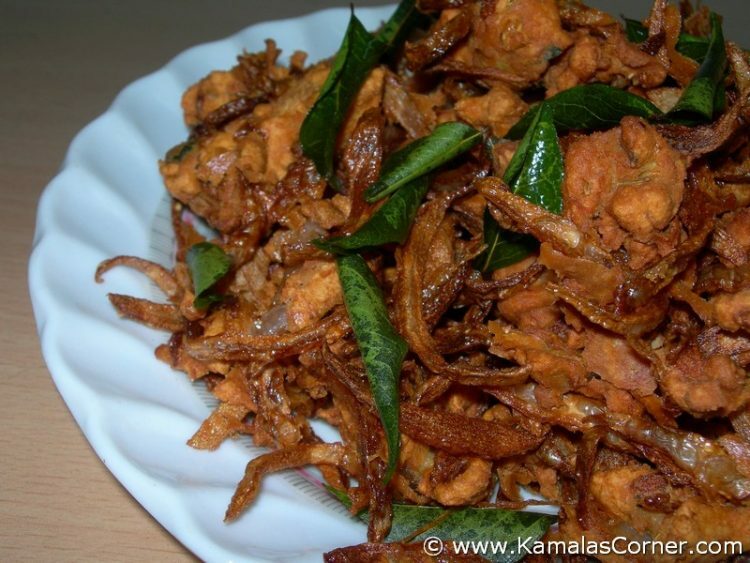 It can be eaten as snack or can be served with hot sambar rice /pulav. Note: If you do not like, you can omit garlic and sombu and instead you can add a pinch of asafetida powder. Thanks for this recipe.. I tried it yesterday and it came out real good. I added some ghee+1/2 tbsp of yogurt.. That was the only modification I did and it still came out great! Its Nice recipe. I tried it today and came good.. Thanks 4 sharing the recipe. Thank you for your kind feed back Prabha. Very nice recipes. Yammy . Thanks for sharing.. Thank you for your kind words Rama. Readers like you only make me to try more varieties and post it here. Very2x tastey.Normally when i fry noodles to garnish i just use onion n plain flour mix make a deep fy.with ur recipie above fantastic.Thanks mam. ARE VERY GOOD AND EASY TO UNDERSTAND THE STEPS.